The term 'flu' is often used for any febrile respiratory illness with systemic symptoms that may be caused be a myriad of bacterial or viral agents as well as influenza viruses. However, true influenza is an acute infectious disease caused by a member of the orthomyxovirus family, which includes influenza virus A, B and C. Influenza outbreaks usually occur in the winter in temperate climates. In the United States, the flu season usually starts in October or November and peaks between December and March. Major outbreaks of influenza are associated with influenza virus type A or B. Influenza A infects birds, humans, swine, horses, seals and dogs. Influenza A is responsible for frequent, usually annual outbreaks or epidemics of varying intensity, and occasional pandemics, whereas influenza B causes outbreaks every two to four years. Influenza B viruses cause the same spectrum of disease as influenza A. However, influenza B viruses do not cause pandemics, possibly because they primarily infect humans and seldom infect animals. Nearly all adults have been infected with influenza C virus, which causes mild upper respiratory tract illness. Lower respiratory tract complications are rare. Influenza A is divided into subtypes according to their hemagglutinin (H) and neuramidase (N) proteins. There are 16 H and 9 N variants, but each virus has only one H and one N variant. Examples of recently isolated influenza viruses are A/California/7/2009 (H1N1) and B/Brisbane/60/2008. The influenza virus is an enveloped virus, meaning that the outer layer is a lipid membrane which the virus acquires from the host cell. Inserted into the lipid membrane are the viral glycoproteins, hemagglutinin (H) and neuraminidase (N). Influenza A virions have three membrane proteins (H, N and M2), while Influenza B virions have four (H, N, NB and BM2). Beneath the lipid membrane is the M1 viral matrix protein that provides strength and rigidity to the viral envelope. M2 protein is a proton channel that is the target of the antiviral drugs amantadine and rimantadine. Within the influenza A or B virion are eight segments of viral RNA that carry the all the genetic information needed to synthesize new virus particles. These RNA segments are labeled HA (hemagglutinin), NA (neuraminidase), PB1, PB2, PA, NP, M and NS. 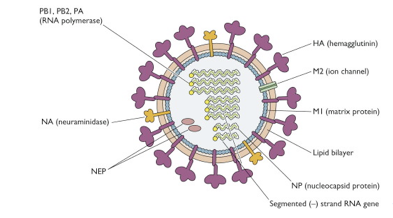 Antigens on the internal proteins M1 and NP are type-specific and used to determine if a particular influenza virus is type A, B or C. Both M1and NP proteins of all members of each type exhibit cross reactivity. Hemagglutinin is a surface glycoprotein that binds to sialic acid residues on respiratory epithelial cell surface glycoproteins. This interaction is necessary for attachment and fusion of viral and epithelial cell membranes. Neuraminidase digests sialic acid (neuraminic acid) on the surface of target cells, promoting entry of the virus into the cell. Neuraminidase also facilitates penetration of the mucus layer in the respiratory tract. By late infection, almost all sialic acid has been removed from infected cell surface making it is easier for progeny virions to disseminate to other cells. N is the target of the antiviral drugs Relenza and Tamiflu. Influenza C viruses are somewhat different. They contain 7 RNA segments instead of eight. The major influenza C virus envelope glycoprotein is called HEF (hemagglutinin-esterase-fusion) because it has the functions of both the H and N. A minor viral envelope protein is CM2, which functions as an ion channel. H and N exhibit more antigenic variation than the internal proteins and are the major determinants of Influenza A subtype and strain-specificity. With 16 H’s and 9 N’s, there are 144 possible subtypes of influenza A. Minor changes in the envelope glycoproteins, hemagglutinin and neuraminidase, are referred to as antigenic drift, and major changes are called antigenic shifts. Antigenic drifts are associated with localized outbreaks, while antigenic shifts are associated with epidemics and pandemics of influenza A.
Antigenic drift is due to a point mutation in HA and/or NA. Inefficient proofreading by influenza viral RNA polymerase results in a high incidence of transcription errors and amino acid substitutions in hemagglutinin or neuraminidase, allowing new variants to evade preexisting humoral immunity and cause influenza outbreaks. An individual immune to the original strain is not immune to the drifted one. Antigenic shift is due to HA or NA gene reassortment that results in synthesis of new H and/or N protein variants. Wild aquatic birds are the natural hosts for all subtypes of influenza A virus. Pigs also play an important role in the evolution of human pandemic strains because pig trachea contains receptors for both avian and human influenza viruses and pigs support the growth of both types of viruses. Genetic reassortment between avian and human virus may occur in pigs, leading to a novel strain. When a pig becomes infected with both human and avian viruses, the RNAs of both viruses are copied in the nucleus. When new virus particles are assembled at the cell membrane, some of the RNA segments may originate from either of the infecting virus. New viruses that inherit RNA from both avian and human influenza are called reassortants. They may contain human internal proteins and animal H and/or N proteins. If this virus reassortant can infect humans, they will have little immunity to it, increasing the likelihood of an epidemic or pandemic. The H1N1 pandemic that occurred in 2009 was due to reassortment of avian, human and swine influenza viruses. Reassortment can only occur between influenza viruses of the same type. It is not understood why influenza A viruses never exchange RNA segments with influenza B or C viruses. Influenza B is much less likely to undergo antigenic shift, possibly because there is not an animal reservoir for this virus. Although 16 H and nine N virus subtypes occur in their natural reservoir of aquatic birds, only three hemagglutinin subtypes (H1, H2, and H3) and two neuraminidase subtypes (N1 and N2) have established stable lineages in humans and caused widespread human respiratory infection. H1N1 and H3N2 cause seasonal epidemics today. Antigenic shifts have been responsible for several human pandemics. The extremely severe pandemic of 1918 and 1919 (swine influenza or Spanish influenza) was associated with the emergence of antigenic shifts in both hemagglutinin (H1) and neuraminidase (N1) of influenza A. This virus killed between 50 and 100 million people during a two year period. The H1N1 virus responsible was derived from an avian strain that adapted to infect and efficiently transmit between humans. Several other influenza pandemics have occurred in humans during the 20th century. In 1957, a human-avian reassortant produced an antigenic shift to H2N2. This virus was termed the Asian flu because it originated in China and then spread worldwide. It lasted until 1958 and caused between 1 and 4 million deaths. In 1968, another human-avian reassortant produced an antigenic shift from H2N2 to H3N2 (Hong Kong flu). Since the antigenic shift involved only hemagglutinin, this pandemic was less extensive than that seen in 1957, causing 750,000 deaths. H3N2 influenza A reoccurred in late 2003 and early 2006. It is currently endemic in both human and pig populations. Resistance of this virus to amantadine and rimantadine has increased from 1% in 1994 to 91% in 2005. In 1977, an antigenic shift produced an H1N1 influenza A virus that affected primarily young individuals who lacked preexisting immunity to H1N1. Since the late 1990s, triple reassortant swine influenza A viruses containing genes from swine, human, and avian strains of influenza have been detected among swine herds in North America. In March 2009, an outbreak of H1N1 influenza A virus was detected in Mexico that spread rapidly to the United States, Canada, and throughout the world. The pandemic was declared to be over in August 2010. This pandemic was caused by a quadruple reassortment of two swine strains, one human strain, and one avian strain of influenza. The virus was called Swine Flu because the largest proportion of genes came from swine influenza viruses. In response to the potential for a major pandemic, a mass vaccination campaign using an H1N1 monovalent vaccine was undertaken. Although the WHO declared this pandemic over in 2010, this H1N1 strain continues to circulate around the globe along with the seasonal flu. H1N1 was included in the 2011 seasonal flu vaccine. Novel influenza A viruses that normally circulate in animals may infect humans. These viruses are referred to as “variant influenza viruses” and, as an abbreviation, will be designated with a “v”. As of December 23, 2011, the Centers for Disease Control and Prevention (CDC) has received reports of 35 cases of human infection with swine origin variant influenza viruses since 2005. The frequency with which these variant influenza viruses have been detected has increased since 2011. 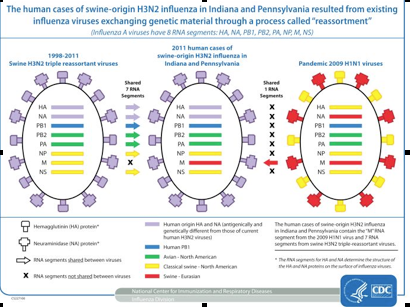 In the last 6 months of 2011, 12 US residents in 5 different states (Indiana, Iowa, Maine, Pennsylvania, and West Virginia) were found to be infected with this influenza A H3N2 variant virus that had genes from avian, swine, and human influenza viruses. This virus differs from the other cases because it has acquired another genetic change, the matrix (M) gene from the 2009 H1N1 pandemic virus. At this time, no one knows what the addition of this M gene means in terms of illness severity or transmissibility in humans. So far, most illness associated with this virus has been mild and self-limited. Limited serologic studies conducted recently at CDC indicate that adults may have some preexisting immunity to H3N2v, whereas children likely do not. The following diagram demonstrates how the new virus resulted from the reassortment of the matrix (M) gene segments from the 2009 pandemic H1N1 virus with the HA and NA gene segments from the Swine H3N2 triple reassortment virus from 1998 – 2011. Influenza A (H3N2)v viruses detected to date are susceptible to oseltamivir (Tamiflu®) or zanamivir (Relenza®). Because these viruses have the M gene from the influenza A (H1N1)pdm09 virus, they are resistant to amantadine and rimantadine. Most influenza viruses that infect wild or domestic birds cause limited illness in humans. However, viruses within the H5 and H7 subtypes have acquired genetic properties that have made them more virulent. Highly pathogenic avian H5N1 influenza A viruses are endemic among bird and poultry populations in Asian countries and are considered the world's major influenza pandemic threat. The first association of avian influenza H5N1 with clinical respiratory disease occurred in Hong Kong in 1997 during a poultry outbreak of highly pathogenic H5N1 influenza in live-bird markets. This outbreak was associated with a high incidence of pneumonia and a 33% mortality rate. All virus genes were of avian origin, suggesting that H5N1 had jumped the species barrier without adaptation. Serologic surveillance revealed little evidence of human-to-human transmission, and no further cases were reported following mass culling of poultry. 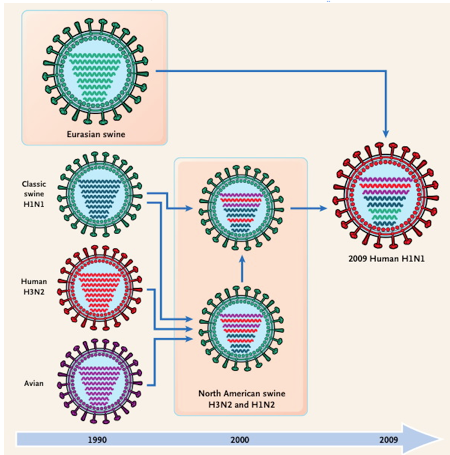 Since its emergence in humans in 1997, influenza H5N1 has undergone antigenic drift. In addition to infecting poultry and humans, H5N1 virus appears to have extended its host range into felids. Fatal infection in domestic cats has been reported. There are no reports of cats transmitting the virus to humans. So far all human subtype H5 infections have resulted from viruses possessing the N1 subtype. Concern remains that this viral strain might mutate, or undergo reassortment with a human influenza virus, and acquire the ability to spread rapidly from human to human. Avian influenza H7 viruses have also been linked to occasional human disease. Subtype H7 viruses with multiple N subtypes (N2, N3 and N7) have transmitted from birds to humans. Extensive outbreaks of H7N7 occurred among poultry in the Netherlands in 2003. Workers involved in the control of these outbreaks developed conjunctivitis and influenza-like illness. Additional infections have been reported from Canada, the United States, Italy, and the United Kingdom among poultry workers. As with H5N1, all genes from the human viruses were avian in origin. Avian H9N2 viruses are endemic in poultry in Asia and have been isolated from pigs. In Hong Kong in 1999, 2003, 2007, and 2009, influenza H9N2 viruses were isolated mainly from children with mild, self-limited respiratory infection. The H9N2 viruses responsible for the 1999 human infections contained internal genes homologous to those of the 1997 H5N1 viruses, suggesting that reassortment had occurred between these strains.